Your Donate Now page can be converted to Pledge Mode to allow users to pledge donations contingent on future events (such as read-a-thons, matching grants etc). Note: Optional Offset fees to cover credit card processing fees cannot be collected in Pledge mode because the software does not store the users' decisions to opt in or out. 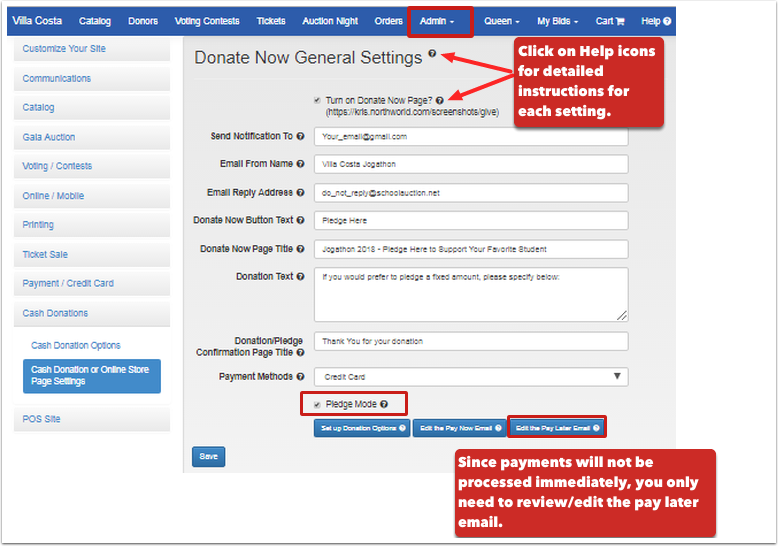 Check out the Demo site for an example of how the software can be set up to accept pledges, then follow the instructions below to set up your own site/page. When you're ready, you can Send Invitations to Pledge to you supporters. 1. Set your fixed pledge option to sell on your Give Page. 2. Allow One Time Donation. 3. Choose amounts guests can give (ie 5, 10, 15, etc) and/or allow them to enter an amount. (Use spaces, not commas, between options. 4. 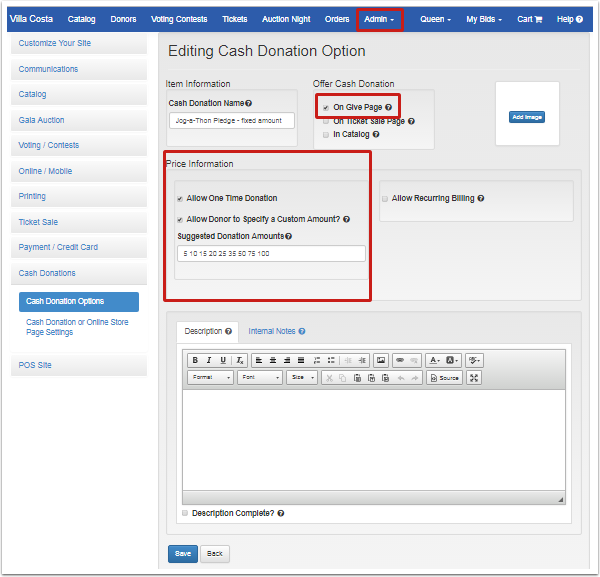 Edit the default text for the donation amount field, if desired. 1. Click on the Edit Icon and add your text and images using the HTML Tool Editor. 2. The Items you create for each Pledge level will display here. 3. You can add one or more Custom Fields (for buyers) as needed. Go to: Admin > Site Settings > Payment / Credit Card > Custom and External Payments to provide details about how and when pledge payemtns will be processed. 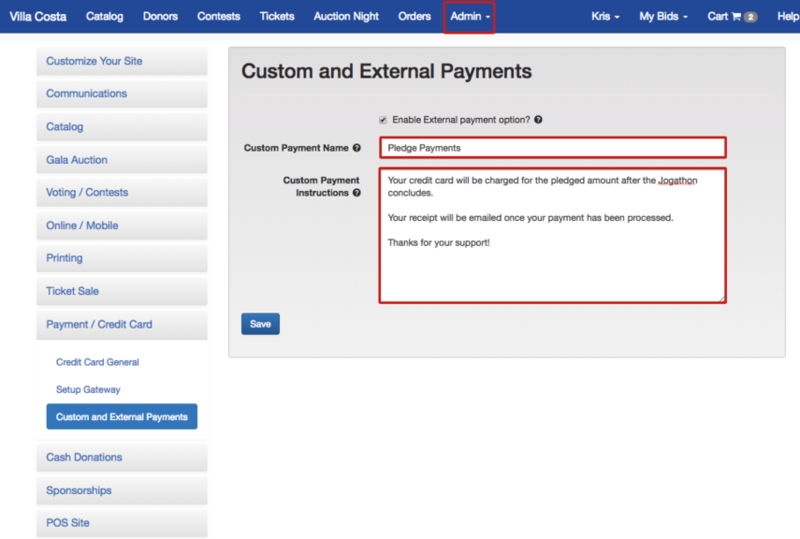 This "custom payment" message will display on the confirmation page and on any invoices generated.